Following the success of last year’s dedicated fundraising initiative, ‘The Isle of Skye Blended Scotch Whisky Munro Challenge’ will once again take place throughout September of this year. The Munro Challenge encourages Scots of all ages and abilities to take on one of Scotland’s imposing Munros in aid of Scottish Mountain Rescue. Following the debut success of its support for Scottish Mountain Rescue, Ian Macleod Distillers, one of Scotland’s leading family-owned distillers and bottlers, has today announced a second year of support for the vital emergency service through its Isle of Skye 8 Year Old Blended Scotch Whisky. 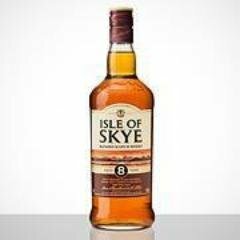 The world’s most respected and influential spirit competition, the International Spirits Challenge, has awarded a gold medal to Isle of Skye 8 Year Old Blended Scotch Whisky. How would you sum up the job of a volunteer? "Long hours, no pay, horrendous weather, dangerous, exciting... and just great fun!" How would you sum up the job of a volunteer? "Hard work, good fun." A special UK edition of the Isle of Skye 8 Year Old Blended Scotch Whisky bottle featuring a bespoke fundraising label has been launched by Ian Macleod Distillers with 15p from the sale of each bottle going directly to Scottish Mountain Rescue. How would you sum up the job of a volunteer? "Time consuming but rewarding."